When it comes to moving, it’s easy to become overwhelmed with packing, checklists and expenses. So how can you manage it all without letting things fall through the cracks? There are several apps that can take the guesswork — and some of the stress — out of moving. So before you start the heavy lifting, download any or all of these smartphone apps for moving. Between packing, closing on a house and scheduling moving trucks, you’re bound to forget something. The Move Planner app allows you to create checklists for all of your moving to dos so nothing gets left off. The app gives you more than 100 pre-populated to dos, helping you remember even the things you forgot to put on the list to begin with. You can also add your own tasks and sort them all by subject or date. The app is compatible with iOS devices and costs $1.99. There’s also a similar Android app, Moving Planner, for $0.99. Locate and see what’s inside of each box without ever unpacking with Moving Van (right). The app doesn’t have x-ray vision, but it will help you find specific items you’ve packed and identify the boxes they are in. When you’re packing, use the app to list the contents, take photos of the items and assign each box with a name or number. You can also assign each box to a certain room. Once you move, you can search the app for specific items and identify which box they are located in. It might a little more time to the process in the beginning, but we all know how frustrating it can be when you need to find a can opener in a pile of unopened boxes. Moving Van costs $1.99 and is compatible with iOS devices. Similar to Moving Van, Sortly allows users to locate items by searching info and photos. It also gives you the option to take a 15-second video of the items. 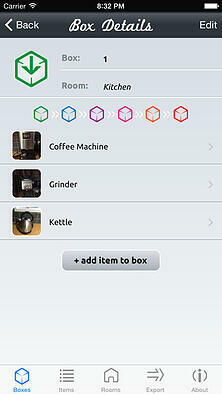 With this free app for iOS devices, you can inventory all of your items as you’re packing. Once you move, you can look through the app to find where each thing is located. The app also has a moving checklist and QR labels you can print and put on boxes. If you have an Evernote account, Sortly will autosave your items to the app, as well. 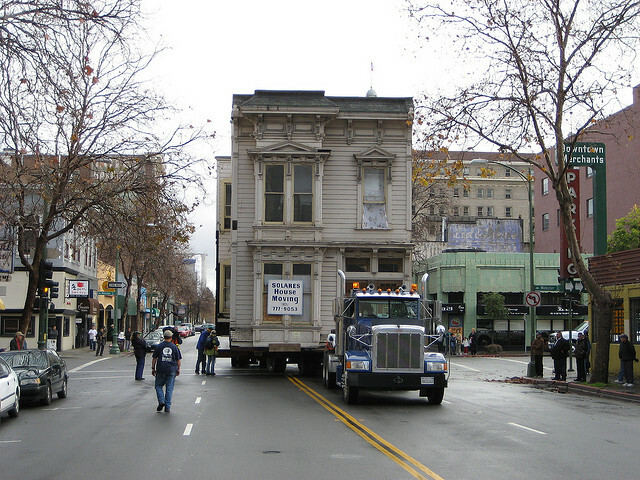 Let’s face it: Moving can be expensive. Not only are you buying a home, but you also have to pay to get all of your items to the new location. To help you figure out how much it will cost to move your furniture and other items, use Move Estimator. The app allows you to get quotes from moving companies, choose self-storage units based on the volume of items you want to store and get an accurate inventory of your home. You can search through the app’s database or create custom data to add an item’s weight and size. Then, you can create room categories — such as kitchen, master bedroom or garage — and add the items. That will help you keep track of where everything needs to go in your new home and also show you how much it will weigh (and consequently cost) to get you there. You’ll also be able to figure out what size truck you’ll need to fit all of your items. The app costs $2.99 and works with iOS devices. 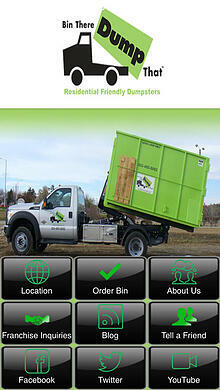 Another important tool that will make your move go more smoothly is a dumpster rental. The Bin There Dump That app (right) allows users to order a bin, find a franchise location, check location hours, view comments, read blogs or see company social media sites. Some local franchises also have their own versions of the app available. The free app puts the power to order a bin in the palm of your hand — making it quick and easy to schedule a dumpster drop off. And anything that can make a move less stressful is a must. You can use the dumpster to throw out old items, furniture, appliances or junk before you move, which will cut back on what you have to load in the truck. Having a bin at your new home will also come in handy for throwing out boxes or other items you didn’t mean to take with you. These apps can definitely come in handy with your next move — whether you’re going across town or the country. Several moving companies offer apps, as well, allowing users to request quotes or track shipments. There are also several other non-moving apps that will also come in handy, like weather, map and interior design apps. You can use sites like Updater, as well, to forward your mail, update accounts, connect utilities, hook up home services, search move-in offers and even share your moving announcement. So before your next move, make sure you have right apps for the job.